Today was the cruise on the Li River. I can't even begin to try to describe the scenery. Hopefully it will come across in one of the pictures I took. 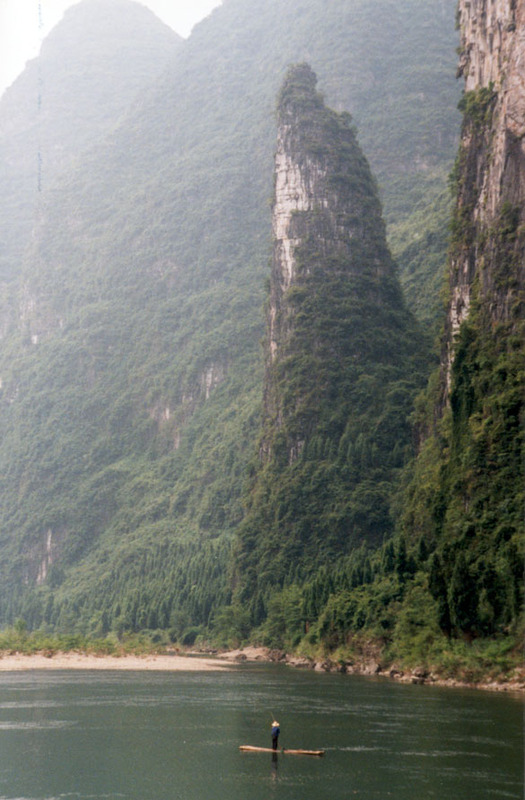 Again we saw terrain to rival the Three Gorges-- if not in scale, then certainly in beauty. There was a little bit of rain at the end of the trip, but only a little and it didn't interfere with anything. Well, okay, I had to wipe the camera lens a couple of times. No big deal. 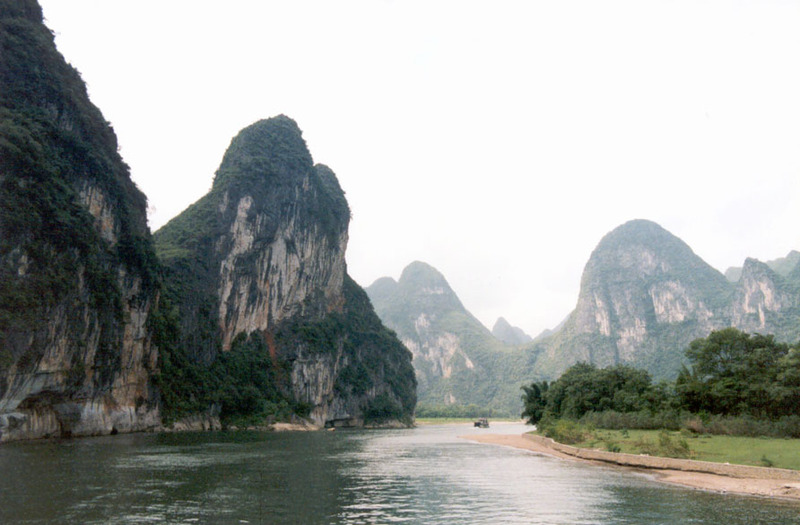 Here the mountains are much bigger, and closer together, than they are in the vicinity of Guilin. It isn't quite the same as the towering columns one sees sticking out of the sea in James Bond movies, but no less impressive: half-dome peaks dropping stright into the river, spiral-cut columns with names like "Snail Rock," and a river so clear that we can see the stones at the bottom, even from on top of our boat. We saw a cave mouth in the river-bank which dwarfed the people standing there. Andm between the sharp peaks of close mountains, another line of mountains would be visible, and between the peaks of that line, even more mountains, each growing grayer and less distinct through the distance-haze. It's really a shame that we have so little time here. Kat and I have already agreed that if we ever come back to China, we'll arrange a trip which includes an extended stop in Shanghai; the Yangtze cruise (possibly both ways), assuming that they're still conducting them by the time we get back; and several days here in Guilin and the surrounding area. It's become quite obvious why Guilin is a favorite destination for honeymooners in China (we were told at one point that it was "the Niagra Falls of China," despite the lack of a waterfall). For dinner, I decided that, even though the tour company was offering us free dinner in the Chinese restaurant in the hotel, I really needed something non-Asian. Everyone has a limit to how much Chinese food they can eat, and sometime today I'd hit mine. So we went to the lobby café and I ordered a club sandwich and a milkshake. Back home, I would have given the meal a so-so rating; here, it was wonderful, right down to the vaguely spiced fries. Even the fact that the sandwich used Swiss cheese didn't dissuade me; I just peeled it off and kept going. Several other members of the tour group showed up at the café for dinner as well, which I thought was an interesting phenomenon. In the evening we saw yet another cultural show, this one at the hotel. This one was a series of folk dances and other performing arts. It was often interesting and occasionally challenging-- but overall, good fun. Another early start tomorrow. We'll be sad to leave here, even more so than we have in some other places.